BeenThere-DoneThat: The area around Malham, Yorkshire Dales, North Yorkshire. 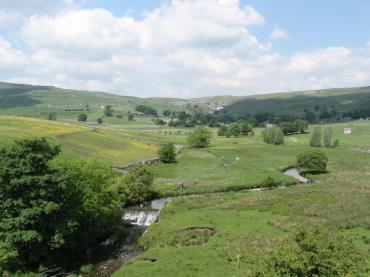 This view is about 1½ miles south of Malham and a little under a mile below the source which is the confluence of Malham Beck and Gordale Beck ( Beck is the Yorkshire term for stream). Malham Cove can be seen in the distance. The River Aire joins the River Ouse which eventually drains into the North Sea. Malham is about 10 miles approximately south east of Ingleborough. 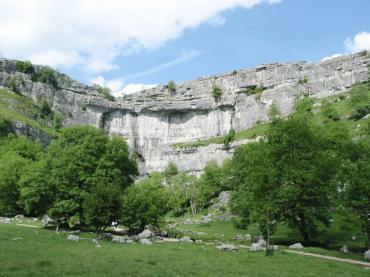 These impressive cliffs, about a mile from the village of Malham, are over 300 feet high and are formed from Carboniferous Limestone which is about 350 million years old. 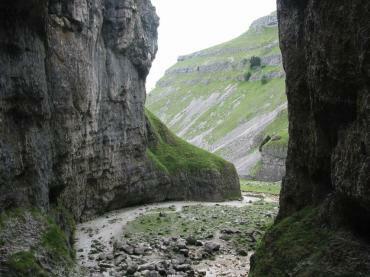 There is a stream flowing out of the bottom of the cliffs, known locally as Malham Beck, which later joins the stream from Gordale Scar and forms the source of the River Aire. This picturesque little waterfall is in Gordale Beck before the beck joins Malham Beck and becomes the River Aire. 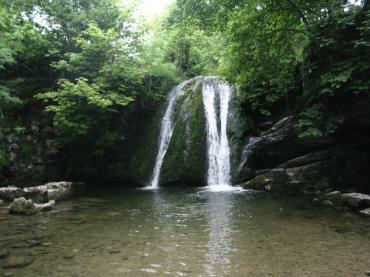 The term 'Foss', and 'Force', stem from the old Norse word for waterfall. This view is looking out from within the lower end of this impressive limestone gorge, over 300 feet high, with Gordale Beck flowing through it. It is possible to scramble up through the gorge to the higher ground beyond but you do so at your own risk.